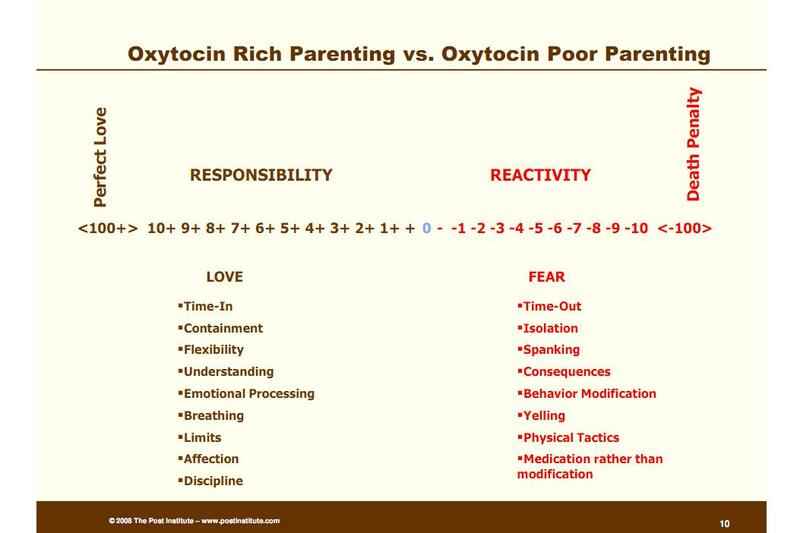 When I first saw this slide it was entitled “Love based parenting vs Fear-based parenting.” Fear induces the release of stress hormones which over time has many negative effects. Ocytocin is our loving, bonding hormone which promotes optimal development, positivity, and connection. This visual displays vividly the continuum I feel in my heart, the dichotomy that exists in our society, and the constant conflict I face when I show others love-based responses. Sadly, much of traditional parenting is fear-based. Most times when I witness parents interact with their children, they are operating from a fearful lens. Parents tend to view their children’s behavior as a report card that reflects how they are doing as a parent. They fear if the child is behaving this badly now, then they are for certain on a destructible path to failure and hardship in the future. This naturally instantly triggers fear and insecurity for the parent causing the, to react negatively, mostly with threats and statements that send a message of mistrust and “What is wrong with you!?”. I understand how it may seem impossible to believe love-based responses truly work when you are in the grips of fear and perpetually stressed. One is constantly being triggered into a reactionary state when our stress buckets are full and our vital needs are neglected. Taking deep breaths and becoming mindful of our thoughts, feelings, and actions help us slow down and choose an appropriate loving and respectful RESPONSE to relieve stress and get everyone’s needs met. Feeling safe and understood is VITAL for optimal growth and connection. Please fear less, LOVE MORE.